Recently, during a session of blog and website housecleaning, where I was looking for dead links, a trend emerged. Some of my fellow authors, especially the younger ones, have deleted their blogs. Christina Barber’s “The Writer’s Crypt” seems to be history. Susan Grant ended her “Come Fly with Me” blog in favor of a news section on her website. A particularly good one, “Faster Than Kudzu“has also moved. Other blogs are on hiatus. No doubt more blogs will go away, because the online audience is moving toward different web addresses. For a time, My Space was popular, but no more. Right now, Facebook is the most important medium for many who want an online presence, but I suspect that it, too, will be supplanted by another form of communication. Groups, such as the ones on Yahoo and Google, were big news a decade ago. While I am still connected to some of these “list/serve” sites, I’ve left a number of the groups I where I was once a member, and for most of the others, the “daily digest” is no longer in my inbox. Online forums are also fading away, albeit more slowly. I was once fairly active on the SFReader boards, but if I spend a lot of time doing online promotion and/or writing, I don’t do any real writing, and that is a problem. Other authors have mentioned that online promotion, although cheap, is expensive in terms of time. My goal, at the beginning of”Pam’s Pages,” was to promote my writing, to connect with people as a “real person” with ideas and opinions beyond what I express in my fiction writing, and to have a place to float concepts before I put a great deal of time into writing more formally about them. In 2005, when I began this blog, publicity experts were touting frequent updates, perhaps daily, to keep a blog at the top of search results on Google. While I didn’t think daily would ever be realistic, I thought could manage once a week, and I have averaged that. But once a week, or even once a day, can’t compete with Twitter. Lately, due to time constraints and social constraints, “Pam’s Pages” has leaned more toward book reviews, which is fairly easy for me, since would be unusual for my reading to amount to less than a book a week. How ironic; thus, this blog an out-of-date means of communicating about an out-of-date hobby, reading. One of my favorite eBook authors is Darrell Bain. I think of him as the master of plots. Oh, there are some problems with his writing, primarily in the “show don’t tell” category, but this guy writes the most amazing yarns. In the dedication of The Long Way Home, Bain recognizes three important Baen Books authors— David Weber, John Ringo, and Travis Taylor. And fans of their brand of science fiction will no doubt see that these authors influenced Bain in this space-based tale. Weber writes military science fiction on a grand scale; Ringo puts the grunt into military fiction, and Taylor is a rocket scientist who can also spin a good space opera. Bain doesn’t do any of those quite as well as these guys, but he does blend the elements quite well. The plot is not unusual, with opening scenes of an exploratory vessel far from home, and a first contact mission gone awry. But instead of one or two explorers meeting a premature end, as happens in James Alan Gardner’s Expendable series, there is a massive loss of life and starship, and a small “longboat” known as “The Hurricane Jack” is left to ferry the survivors home. And it isn’t a short journey, hence the title. There are many obstacles, and the conflict is almost non-stop, between the “monkeyclaw” ship following the survivors, and the internal debates over matters in the tightly packed small ship. The mission is now to save the survivors and warn the human population about the vicious species they wished they had left behind. As a small vessel, the longboat must stop to scavenge material, and every stop has some built-in danger. Unlike some writers, Bain is not afraid to kill off his characters, which ramps up the peril factor. 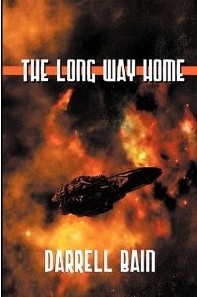 Fans of space exploration stories should enjoy the action-packed suspenseful voyage of “The Hurricane Jack” in Darrell Bain’s The Long Way Home. I really like David Weber’s military science fiction. A few thousand fans of this sub-genre seem to like it as well; his books, even the ones which are ridiculously swollen with unnecessary and/or undesirable content, sell well. He has also partnered with other authors, including Eric Flint and Steve White, which helps lengthen his list of published novels. My introduction to his work was a rough go, however. The science fiction book club was touting his In Enemy Hands, which is fairly far into the Honor Harrington series, but I began with that one, not realizing that I had to catch up. There were several times I nearly abandoned it; but about three quarters of the way in, I realized this was indeed a fascinating tale; albeit one which could have been told without quite so much detail. Intrigued, I read a couple of his stand-alone novels, The Path of the Fury and The Apocalypse Troll. While featuring hardware and propulsion concepts, more than characterization, these yarns did not require any backstory, and that helped. After I finished those, I read the Honor Harrington series, from the beginning. The first book is not particularly interesting, being mostly a set up for the series, but the series hits a good stride with books two through six. The seventh book, Echos of Honor also has its moments, but the page counts grow and the synopsis gets shorter with each successive installment. I read most of the series, but I think I have been reading on At All Costs, which may or may not be book twelve, for a couple of years and I have yet to finish it. Instead, I go back and re-read earlier titles. Some of Baen’s earlier Weber titles, including The Apocalypse Troll, are available as eBooks, and I have been re-reading it. Yes, it is perhaps less polished than some of his more recent offerings, but it is also far less bulky than his newer work. No, he still doesn’t really write many multi-dimensional characters. Still, I enjoyed it. No one else seems to have the ability to write large scale battle scenes, but Weber does. He also has a firm grasp of the problems and possibilities of technologically driven warfare. Too many writers of space opera write about conflict one-on-one, because that is easier. In Star Wars, there may have been a lot of blasts, but the camera follows Luke and Han, and everything else is a backdrop. That is both cheaper and easier. However, any civilization which moves to the stars will have multiple ships, weapons, and drive mechanisms. Weber writes about those situations, and when Weber is finished with a battle, the casualties are in the thousands. That is what real war is, and it will be in the future. So, the bottom line is that fans of futuristic writing may or may not like Weber, but most fans of military science fiction do, because he delivers large scale entertainment. Readers should sample the early stories, like The Apocalypse Troll or Path of the Fury, or at the beginning of one of his many series, rather than diving in the middle, however. Troll is the story of a twenty-fifth century monster unleashed on our current earth, with only one surviving warrior from the future to tackle it. When researching the published reviews, I read that this novel was the first David Weber wrote, but it was published long after he had become established as a writer. So, while still Weber, the complexity is not so vast, and there are not so many references to politics, which is a major flaw in some his Honorverse works. But not everyone agrees that The Apocalypse Troll is a winner, so here is a link to a differing opinion of this novel over at RPG.net.